"Our grooming collection welcomes the new year with a brand new scent. Now available in signature Colonia notes, it's time to amp up your gentleman rituals! 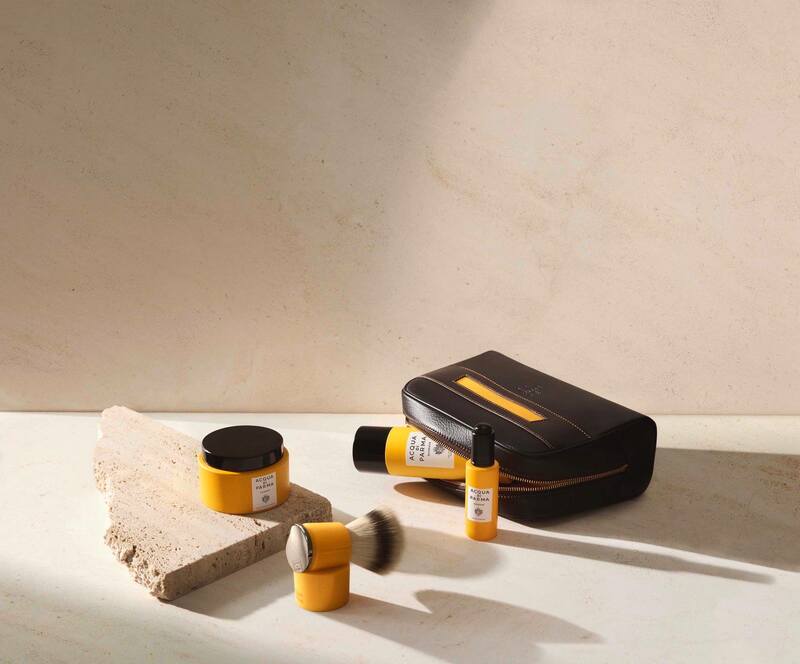 Exclusively available at acquadiparma.com and our Milan, Rome and Paris Boutiques"
I'm looking forward to seeing the Colonia Intensa scent as well. Not a huge fan of the Colonia. That travel bag looks awesome. The brush must be synthetic, the handle is a beauty! Brush and stand look pretty nice too! (01-21-2019, 02:48 PM)nikos.a Wrote: I'm looking forward to seeing the Colonia Intensa scent as well. Nikos, thanks for bringing this to our attention! Where did you see the reference to the Colonia Intensa? Very interesting! I've never used their previous stuff, does anyone know if the ingredient formulation has changed? It's very close to, if not exactly the same as, the 2nd generation ("non-Colonia"). These are the ingredients lists. (01-22-2019, 08:20 PM)churchilllafemme Wrote: These are the ingredients lists. Looks like they upped the fragrance on the 2019 version. So I tried to purchase the new cream from ADP's website but was unable to. There is no way to purchase directly from the website. I emailed ADP and they said the new barbiere line should be available to US retailers mid March. "Acqua di Parma Online Boutique delivers to Austria, Belgium, Estonia, Finland, France, Germany, Greece, Ireland, Italy, Latvia, Lithuania, Luxemburg, Netherlands, Portugal, Slovakia, Slovenia, Spain, United Kingdom." I was told that it's possible. Not sure about it though. We can only hope to see this, Matt. Would be great to see some variety! I love the Colonia Essenza most out of those I've smelled. Anyone get their hands on the new cream? Most curious about the scent. The description suggests they’re going back to the Colonia scent? Today, I visited downtown Vancouver to check out some niche colognes and while at the AdP display at a high end department store, I noticed they had almost the full new shaving line. The AdP associate I talked to told me they arrived literally two days ago. They had almost everything minus the hardware. The cream's consistency is very similar to the Collezione Barbiere formulation and yes, the scent to me, is a lighter and slightly less nuanced version of the original Colonia. Now, while the aftershave in the Collezione Barbiere was a very light balm, this new one is labeled as an emulsion and as you would expect has the consistency of a thin gel-like liquid and absorbs very easily, sort of like GFT's skin food. They also have balms for the original Colonia as well as Colonia Intensa, Pura, Essenza, and Club. Personally, even though I like Colonia, I already have a few Colonia-inspired shaving soaps, so I'll likely pass on the current formulation. I actually have come to appreciate the previous formulation Collezione Barbiere's light almond/wheatgerm scent for those days I want a lighter scented shave, so I am contemplating a backup tub. I was thinking about trying it because they have a 20% off in Athens, but then I saw that it contains menthol... Menthol and Colonia scent is a no for me. I'd much prefer a pure Colonia scent, even though I'm not a huge fan of the Colonia scent either. I just wanted to give it a try. (03-30-2019, 03:08 AM)nikos.a Wrote: I was thinking about trying it because they have a 20% off in Athens, but then I saw that it contains menthol... Menthol and Colonia scent is a no for me. I'd much prefer a pure Colonia scent, even though I'm not a huge fan of the Colonia scent either. I just wanted to give it a try. Edit: I did not detect any menthol note in the soap, it smells exactly like the Colonia scent. Thanks for reminding me this! I totally forgot about asking for a sample. If the menthol is barely to not detectable and the performance is good, I may pull the trigger on this. I happened to be downtown earlier and walked in the mall while heading home. I visited the shop and asked for a sample. They didn't have any. BUT, they had the whole new line of products. The synthetic brushes are really cool. They lady was nice and opened the sealed cream tester for me to inspect/smell it. The sealing is similar to the one of I Coloniali for those who know. The scent is very light. If Nuavia is a 10, this cream is a 5 out of 10 in scent strength. It's a nice scent, but I detected a refreshing note in there. Maybe the menthol or just my idea? I am not sure. It's very soft. It's not a croap. It's a cream. I wouldn't use a brush to load from the bowl. I'd take a small quantity and load my brush elsewhere. I slightly pressed it with my finger when the lady wasn't paying attention, it's a tester anyway so no worries. Yes, it's a soft cream.